At Majors Home Improvement, we install front doors for homeowners in Navarre, Florida, and throughout the Panhandle region. 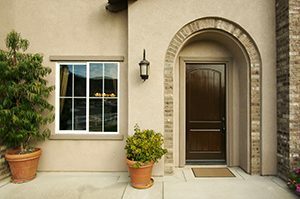 If your current front door is outdated, scratched up, or otherwise needs an upgrade, we can easily outfit your home with a brand-new door that can elevate your curb appeal. Our Majors Select™ fiberglass entry doors are a top-of-the-line product that will make your home the envy of the neighborhood. Beautiful – They are made to resemble wood-grain textures, like oak or mahogany, but since they are made of fiberglass, they don’t fall prey to the typical issues that wood doors do. Energy efficient – Our front doors will provide exceptional insulation, ensuring air does not escape into your home through your door and keeping your indoor temperature optimal. Durable – Thanks to the door’s composite rails and stiles, it will resist rotting, denting, splintering, chipping, and other damage. Plus, with Majors Home Improvement, your entry door will be installed by our factory-trained craftsmen who will do a precise job and also provide you with Red Carpet Service throughout the project. This is the kind of service you’d expect from a locally owned company and it’s part of the reason why we’ve maintained an A+ rating with the Better Business Bureau for many years. If you’d like to schedule a complimentary consultation to discuss the front doors we install for homeowners in Navarre, FL, and surrounding cities, contact Majors Home Improvement today.